My eye routine hasn’t actually changed much recently which is quite unusual given the crazy amount of lovely products that I’ve been treating myself to recently! But for my everyday products, its the same four that I’m always using. 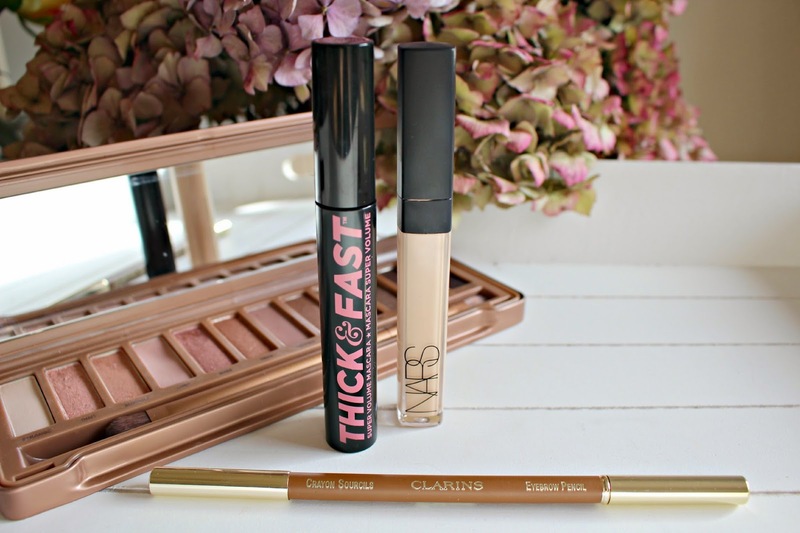 They are a mixture between budget and blowout, and include the Urban Decay Naked 3 Palette, the Clarins Brow Pencil, NARS creamy concealer, and Soap & Glory Thick & Fast mascara (which I actually alternate with Seventeen Falsifeyed mascara, not in the pic – doh!). The first thing I do after foundation is apply NARS creamy concealer under my eyes. I’ve seen beauty bloggers who use SO much of it to really highlight, but I only dot it on and blend with my fingers to slightly brighten the area, and conceal any bags. I wouldn’t say it’s perfect – I find it dulls after a while on my skin, but the texture is lovely and it doesn’t crease. It’s quite similar to Origins Plantscription Anti-Aging concealer which is just as lovely, and lives in my handbag for touch ups! Origins is £17.00 and NARS creamy concealer is £22.00 online here. Then I move toward my brows. My brows are horrendous and I just don’t know what to do with them! They are short, thin, sparse and there doesn’t seem to be anything I can do about it! So I go quite heavy with the Clarins brow pencil. The shade which I have is Soft Blonde, which is perfect if you want to add more depth to your brows without making them too much darker, and the handy comb on the other end makes it ideal for shaping afterwards too. I usually set with whichever gel I find first! It’s either the Eylure brow gel, or even the H&M clear brow gel. Clarins brow pencil is £17.00 from House of Fraser – it’s quite pricey for a brow pencil but for me, the budget pencils that I’ve tried so far just don’t seem to be the right shade for my brows! I find slightly rosy shades really flattering on my skin, so the Naked 3 palette was a no brainer for me. I have used every single one of the 12 shades previously, but for my daily look I use Limit and Nooner when I’m after a matte look, or Burnout, Buzz and Liar for those days when I’d like a bit of shimmer! I’ve used it every day (sometimes twice a day!) for several months now, and it’s showing no signs of ‘hitting the pan’ – all the colours still look barely used so I think the value of this palette is SO worth it. It’s £37.00 available to buy online from House of Fraser, but in lots of shops too. Oops, I forgot to photograph a liner! My eyeliner is usually either an Urban Decay All Nighter liner (which does as it says on the tin!) or again whichever liquid liner I find first. Right now I’m really loving Bourjois Mega Liner which is a calligraphy style tip, or the Zoeva liner which has a super skinny tip for precision lining. I finish with a slick of mascara – usually I apply the Seventeen Falsifeyed mascara first for its magical separating and lengthening powers, before adding mega volume with Soap & Glory Thick & Fast. The mascara gives my lashes a real full effect, I often get asked if I’m wearing falsies when I do a couple of layers of this mascara thanks to its curling and thickening abilities and the creamy formula really wraps lashes so there’s no flaking throughout the day. It’s £10.50 from Boots and part of their 3 for 2 offer right now!